1. In a stand mixer, mix butter for about 30 seconds, add sugar little by little and vanilla, mix until smooth. 2. Add an egg one by one, mixing 30 sec. after every addition. 3. 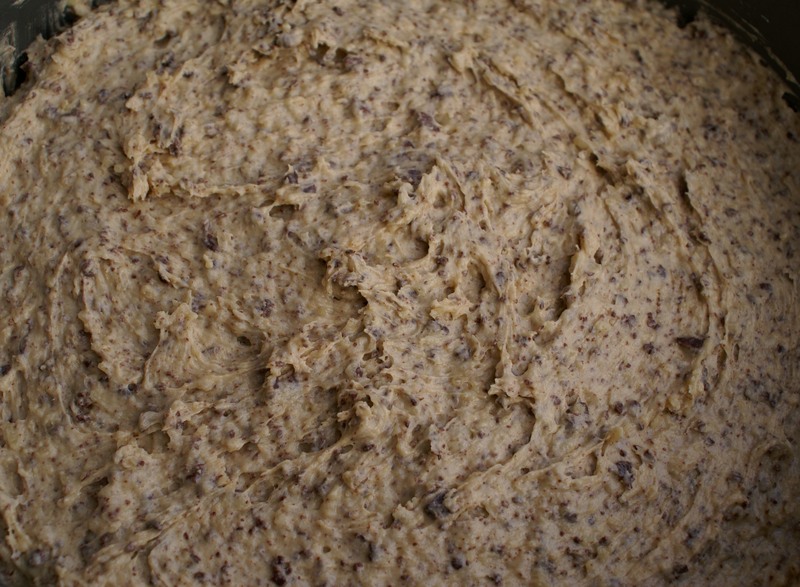 Combine flour and baking powder, mix well. Fold into egg-butter mixture by hand. 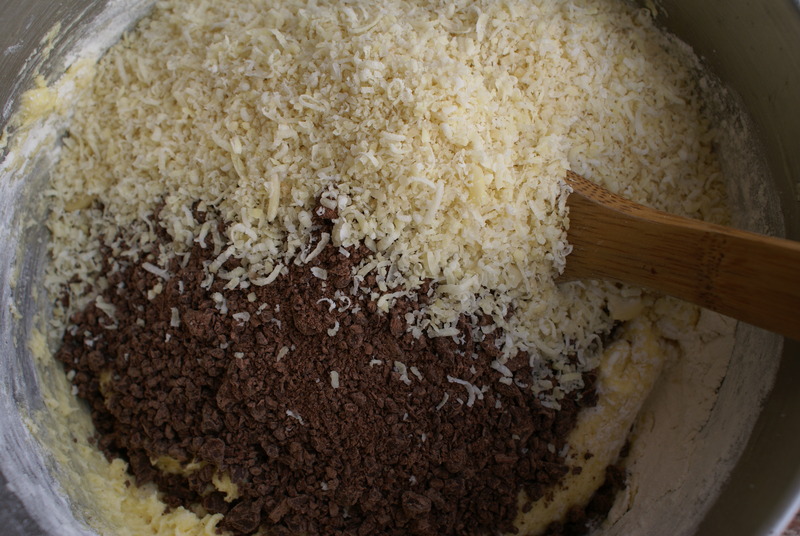 Add shredded chocolate and almonds and mix well. 4. 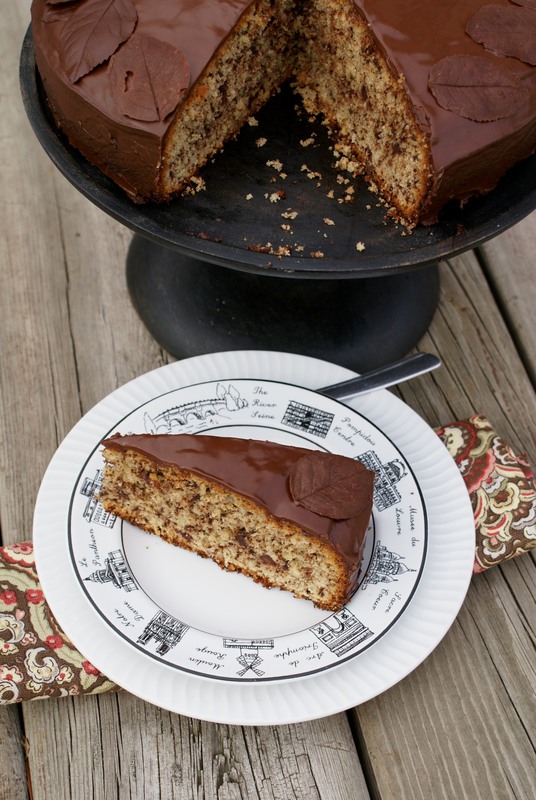 Line a 9 in (24 cm) round cake pan with parchment paper. Evenly spread the batter into the pan. 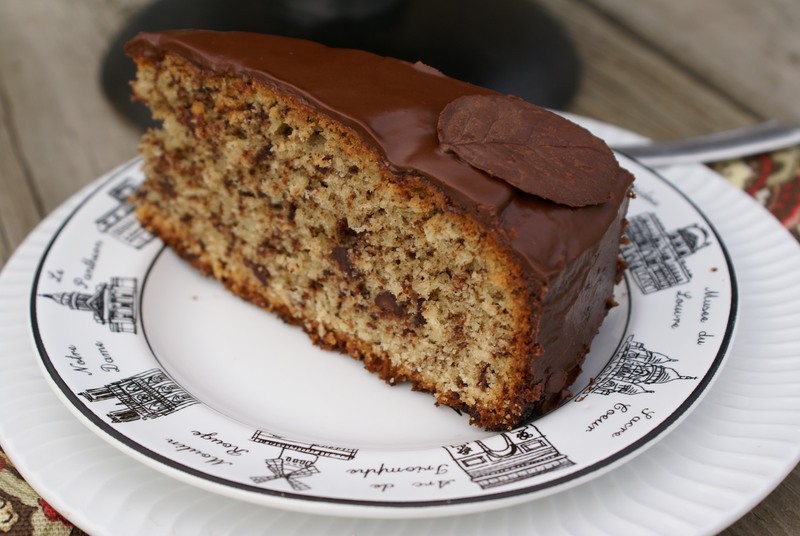 Bake at 375 F (180 C) for about an hour or until soft center of the cake disappears. For the frosting, heat apricot jam for about 45 sec. and strain it through a fine mesh, to become smooth and without any apricot pieces. Brush it over warm cake. Let the cake cool down. Melt the chocolate in a hot water bath, add cooking oil and mix it until smooth and glossy. 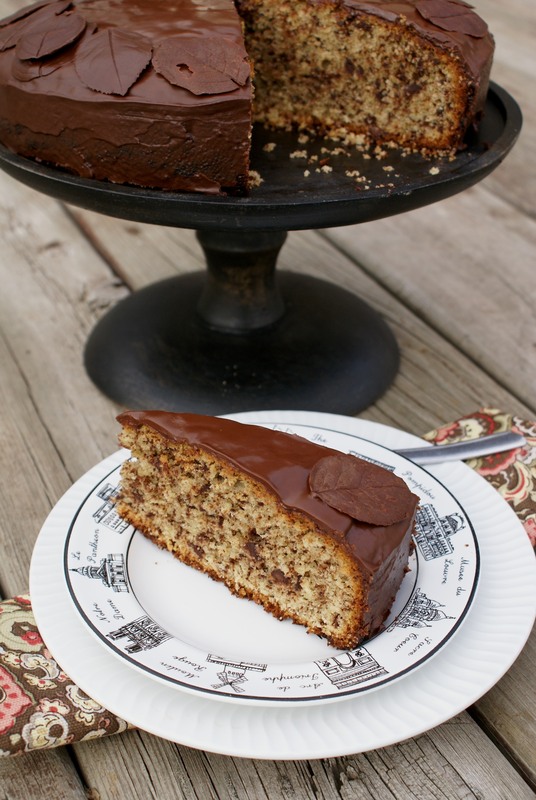 Pour over the cake. Let it stand at room temperature for 15 minutes. Reserve some chocolate for the decoration. For the leaf decoration, get some rose leaves (plastic leaves are fine too). Brush them with chocolate once, let them rest for a few minutes and then brush them a second time. Place them in the freezer for about 15 minutes. 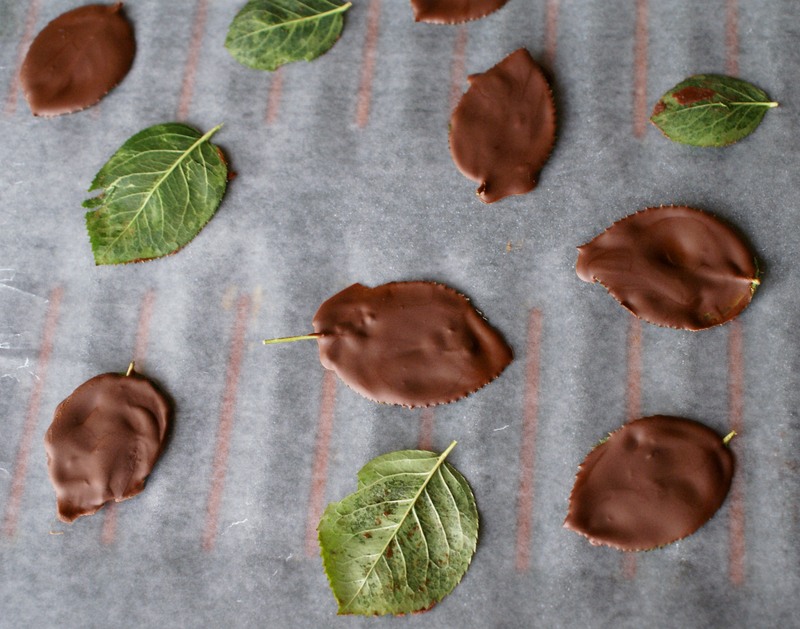 Gently peel of each rose leaf and you should have a beautiful chocolate leaf decorations. The leaves are a beautiful touch! Hvala Sneska moja! E da si blize kako bi fino sjele i slistile ga uz kaficu! 🙂 Kisses and Hugs! 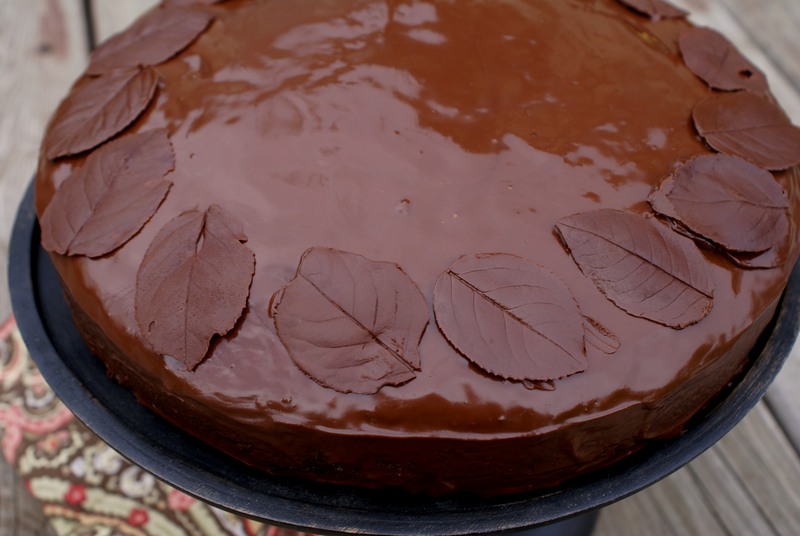 The cake looks delicious, and the leaves are a very artistic touch…. New job is fine, thank you! Still getting used to it… I am not sure if this is really it, but time will show.